We invite a special instructor, Ms. Hiroko WATANABE. There are thousands of soaps in the market. Would you like to make your own soap with original ingredients in a respectful way that soaps in supermarkets don’t get! Soaps are made with generous amount of nutritious high quality vegetable oil, and delicate techniques enable to tightly compress its nutrients into soap without destroying them. That way we can get super moisturizing soaps with hand-making! The fun part, you can choose its size, shape, scent and color just as you like!! In this workshop, we make cold press soaps. Just as it is called, cold press soaps are compressed in low temperature. This process can keep the concentrated state of vegetable oil’s nutritional ingredients without breaking them and can reduce the oxidation of oil. This method is rarely used for commercial products as requires a lot of work and time consuming. The whole process takes about 4 weeks. Max. 4ppl for Each dat. Application is closed when fully booked. Please contact us (your name, workshop you prefer, date, phone number and whether you have made a soap before or not) to info@norikomatsushita.com. Ginger is well-known to warm up body. If you sip a hot ginger tea, you will feel the heat from the tea warm up your core. In this workshop, we will make steamed ginger that will warm your body even more. we will talk about not only how to make it in a pot, but also introduce how to make it in a microwave step by step. You can also have tea with steamed ginger and experience the difference between raw ginger and steamed ginger. Let’s warm your body from the internal organs with steamed ginger and spend this winter well! Amazake is a traditional sweet, low-alcohol Japanese drink made from fermented rice. Amazake is believed to be very nutritious. It contains vitamin B1, B2, B6, folic acid, dietary fiber, oligosaccharide, cysteine, arginine and glutamine. Not only good for the skin, but also for inmmune system and weight loss. 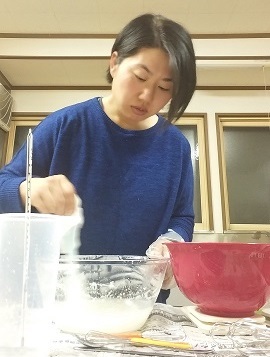 In this workshop, you will learn how to make Amazake and some recipes using Amazake.